Home | Products | Protocol Analyzers and Storage Emulators | SANBlaze Technology, Inc.
SANBlaze Technology, Inc. is a pioneer in storage emulation technologies and a leading provider of storage, networking and multifunction solutions for embedded computing. SANBlaze VirtuaLUN storage emulation software is a key piece of test equipment for anyone developing, testing or deploying storage hardware or software products. Emulated storage targets (disks, tapes and arrays) or Initiators (hosts) can in many instances replace real devices, providing multiple benefits versus the use of dedicated storage hardware. SANBlaze VirtuaLUN Emulation solutions support most storage protocols, including: Fibre Channel, iSCSI, FCoE and SAS. The combination of SANBlaze software with supported hardware provides a powerful, scalable, high performance storage subsystem. Software is ported to best in class NIC/HBA/CNA devices to provide the best performance and feature set for emulated solutions by storage protocol. Protocols can be mixed and matched in any system.For example, A VLF system has two slots, so it could support 2 ports of FCoe and 2 Ports of 16G Fibre Channel.Any variation of the Protocols can be integrated within a system. SANBlaze target emulation systems for FCoE, Fibre Channel, SAS, and iSCSI provide a virtual, extremely cost-efficient configurable environment for SAN product development, testing and QA. The systems reduce the need to deploy large farms of physical “scratch” disks or tapes, providing port density, high performance, non-volatile media at a fraction of the cost of physical disks or tapes. The ability to add latency, have differing read/write sizes, inject a wide variety of errors and save and restore multiple disk configurations provides a flexible and invaluable tool for development, test and QA labs. The SANBlaze Initiator Emulator for FCoE, Fibre Channel, iSCSI and SAS provides simulation of a single to hundreds of Initiator ports. The Initiator product operates on existing SANBlaze VirtuaLUN and GargantuLUN systems, making it easy to integrate into existing SANBlaze environments. The software runs standalone or in conjunction with SANBlaze Target Emulation software for an end-to-end solution. SANBlaze Initiator Emulation provides unparalleled advantages over the real thing: smaller footprint, lower power consumption, centralized management and control and lower cost of ownership. Simulation of hundreds of host devices or initiators is possible in a 1U form factor. Features such as read/write/compare testing, error injection and a custom command builder provide the ideal environment in which to simulate Initiator test cases via script or an easy to use web interface. 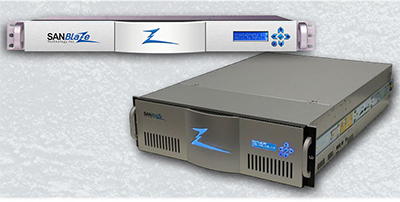 SANBlaze manufactures target and initiator emulators for FCoE, Fibre Channel, iSCSI, SAS and other storage protocols. Our highly conﬁgurable systems are unique in their ability to emulate actual storage devices. Our target emulators allow you to create read/write drives and tapes, control latency and conﬁgure error conditions. Our initiator emulators behave as a real initiator, not just a traffic generator or protocol tester, providing real login and command control. SANBlaze has many years of experience writing and implementing target mode drivers on various platforms. Our own storage emulation products are based on chip sets from a number of leading storage and networking vendors, giving us both driver development and porting experience. SANBlaze has a complete line of AdvancedTCA blades providing building blocks for ATCA system designers. ATCA blades include compute, storage and switching solutions. SANBlaze has developed a growing line of Rear Transition Modules (RTM) that provide storage, networking and external I/O accessibility and expansion. 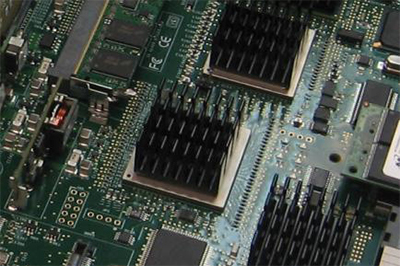 Though primarily conceived to support SANBlaze ATCA storage carriers, these RTMs can be used or easily adapted to work with ATCA blades from most leading ATCA compute and packet processing vendors. Customization services are available to adapt these RTMs to any unsupported vendor ATCA blade. The Rugged Compute Platform for Tactical Ops (RCP-Tactical Ops) is a field deployable ruggedized AdvancedTCA® (ATCA) Platform. The integrated application ready platform incorporates superior computing density, inherent redundancy, class leading power efficiency, modularity and convenient serviceability thus addressing both the COTS and SWaP-C requirements of Modular Open Systems Approach (MOSA) for new DoD acquisition programs.